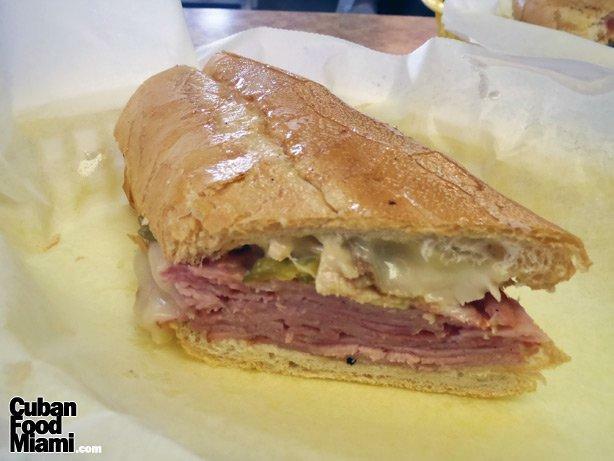 Two cities, Tampa and Miami, are locked in a battle to claim the Cuban sandwich as its own. A Cuban sandwich is shredded pork, glazed ham, Swiss cheese, yellow mustard, and dill pickles – served either cold or hot-pressed on Cuban bread. Think of it as the ham-and-cheese for the guayabera set. Tampa’s version includes Genoa salami. Each city uses differently-shaped bread. Those are about the only substantive differences. Thus, the gauntlet was thrown. So, who has better claim? Here is Miami's argument, by WLRN News Director Dan Grech. I walked into El Pub Restaurante in Little Havana and was immediately greeted in Spanish by a hyperkinetic Cuban woman. The smell of locally baked Cuban bread was thick in the air. She ushered me into a seat at the counter and slapped down a paper placemat with an illustrated map of Florida. Orlando had a drawing of the Magic Kingdom. Cape Canaveral had the Spaceship Endeavor. Miami had a rooster, two dominos and a smiling man in an historic guayabera shirt. I forget what Tampa had. My waitress put a sweating glass of ice-cold water on my placemat and took my order. “Ah, qué bien hablas español,” she cooed. “Y una croqueta de jamón,” I said. A man behind a Plexiglas divider crafted my sandwich. He wielded a two-foot long serrated knife, long enough to cut down a tree. He split a loaf of Cuban bread, smeared a pat of room-temperature butter, wiped the knife against his white apron, carved from a slab of dripping roast pork, wiped his knife, added slices of sweet ham and queso suizo, wiped, smeared yellow mustard, wiped, then expertly flipped a single pickle slice into the air. It arced like a LeBron James three pointer and landed—swish—onto the open face of my Historic Miami Cuban Sandwich. I didn’t need to tell him to hold the salami. He put the bulging sandwich into a hot press and put his full body weight into its compression. Thirty seconds later my steaming sandwich emerged. It was meat-lovers heaven in a flaky crunchy shell. He cut the sandwich diagonally and slid it toward me. I’ve never been to Cuba, but I know what it tastes like.